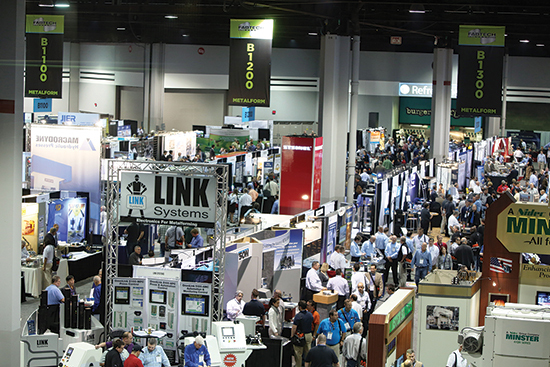 FABTECH 2014 brought a wealth of innovation and technology solutions to Atlanta. Held from November 11 to 13, the show, the largest annual metalforming, fabricating, welding and finishing event in North America, set records for numbers of attendees, exhibitors and floorspace (for a non-Chicago FABTECH). More than 30,800 attendees from over 70 countries attended FABTECH 2014. During the three-day expo, attendees visited with the more than 1400 exhibitors to see live equipment demonstrations and compare products side-by-side to find cost-saving solutions. The following new-product announcements represent just a smattering of the exhibits, which covered more than 550,000 sq. ft.; look for more technology introductions from FABTECH 2014 in future issues of MetalForming and Fabricating Product News. Amada showcased several machines at its massive FABTECH booth, including the new LC 2515 C1 AJ, a combination machine boasting a 2-kW fiber laser and a 49-station multipurpose turret (MPT). Fabricators will benefit from the laser’s process-range expansion feature that enhances its ability to cut reflective materials. The laser head moves in the Y-axis via a direct-drive servomechanism, and is isolated from punching vibration to help maintain beam integrity and cut quality. Reliability is further enhanced by a gap near the laser axis, engineered to allow cutting gas and slag to escape without impacting processing. A cartridge-type lens provides for simple and fast lens changes. In addition, the use of noncontact sensor technology ensures that the laser beam remains focused on the workpiece, optimizing quality. Additional features include a barcode reader for rapid program loading and the energy-saving ECO Cut mode that reduces power consumption. Fabricators simply cannot operate at peak efficiency without modernizing their software, and Bystronic Inc., Elgin IL, led the way in introducing new software options with its Bysoft 7 package. First and foremost is ByOptimizer—cloud-based material-utilization software that employs a patented dynamic-cluster technology algorithm. This unique algorithm, impressively displayed to booth visitors, makes use of high-end computing power not found in traditional PCs. 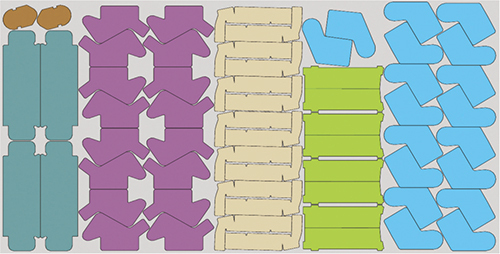 Nesting with ByOptimizer, fabricators reportedly will experience an average increase in material utilization of 10 percent and reduce machine time by an average of 15 percent. The new ByOptimizer service can be accessed directly from the Bysoft 7 user interface, and uses the existing database of parts and material requirements from each part. Amongst the excitement over higher-powered fiber lasers hitting the market, Mazak Optonics Corp. reminded folks that CO2 laser-cutting systems still have their place. Mazak premiered its new Optiplex Nexus 3015 CO2 laser-cutting system at FABTECH, combining high performance with a compact and flexible design, ideal for fabrication job shops looking to expand into laser-cutting services. Company officials note that the Optiplex Nexus was developed “to fulfill the need for a laser that provides significant performance features at an economical initial investment.” It’s offered in single fixed table, manual table or automated two-pallet configurations. The machine integrates intelligent setup and monitoring functions including automatic nozzle changing and nozzle cleaning, automated profiler calibration, focus detection, auto-focus positioning, pierce detection, burn detection and plasma detection. Among the several exhibitors of waterjet-cutting machines at FABTECH, Omax Corp., Kent, WA, showcased its expanded line of Maxiem JetMachining Centers. Omax introduced three larger machine sizes to meet the large-scale production needs of OEMs, metal service centers and fabricators. The first five models in the next-generation Maxiem machine lineup, introduced in April 2014, featured productivity-enhancing features to meet customer demands for cost-efficient yet high-performance waterjet-cutting technology. The lineup now comprises eight models, including the new 2060, 2080 (pictured here) and 3060 JetMachining Centers. The 2060 and 2080 models cut work to 6 ft.-7 in. wide by 20 ft.-6 in. long, and 27 ft.-2 in. long, respectively. The Model 3060 boasts a wider work envelope, ideal for machining a wide range of materials and thicknesses, from metals and composites to glass and plastics. This machine features Y-axis cutting travel of 10 ft.-2 in. and X-axis cutting travel of 20 ft.-6 in. These JetMachining Centers also feature the Intelli-Trax linear drive system that uses brushless servo motors, integrated servo drives and precision linear encoders to provide constant and continuous feedback on cutting-head position. On the value-added front, metalformers were able to find plenty of new-technology offerings among the numerous welding-equipment displays, including that of Miller Electric. 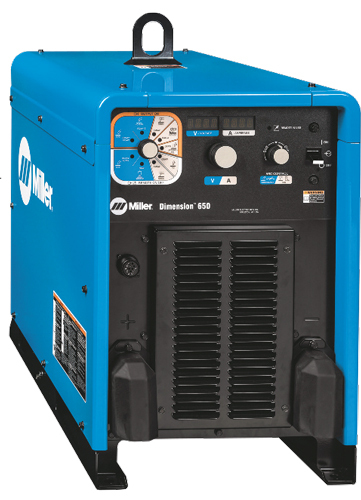 Designed specifically to withstand harsh environments, Miller’s Dimension 650 multiprocess welding power supply provides power-intensive output for heavy welding and carbon-arc gouging, as well as precision arc characteristics designed for thin sheetmetal welding. This compact and energy-efficient machine features a tough, corrosion-resistant, all-aluminum case. The reduced size and weight of the Dimension 650 when compared to the legacy Dimension 652—3.5 times lighter and a 40-percent smaller footprint—makes it easier to handle while still providing the welding performance of a larger machine. In gouging mode, the machine provides 800 A of usable power, and 650 A at 100-percent-duty cycle. 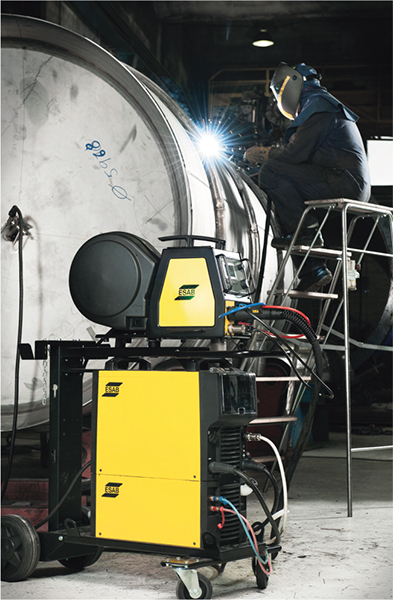 ESAB Welding & Cutting Products, Florence, SC, introduced the Aristo Mig 4004i Pulse power source to its family of welding equipment. The lightweight, multiprocess unit powers gas-metal-arc welding (GMAW) and pulsed GMAW, as well as gas-tungsten-arc welding. The pulse function suits the machine for advanced, spatter-free welding on aluminum and stainless steel. The electronically controlled Aristo Mig 4004i Pulse reportedly weighs 70 percent less than comparable units, and has a footprint that is 80 percent smaller. Typical applications include the manufacture of trucks, busses, trailers, off-highway equipment, trains and railway rolling stock, as well as wind-turbine towers, structural steelwork, shipbuilding/offshore and general industrial fabrication. Sixty synergic lines are dedicated to aluminum welding. 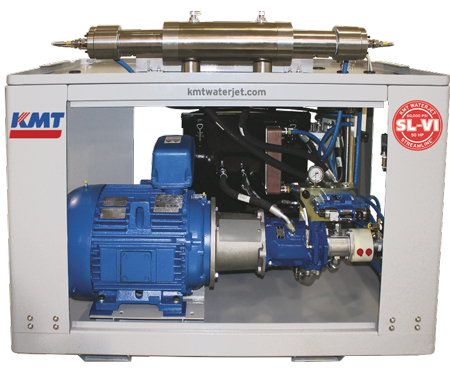 There seems to be a rush to get new waterjet-pump technology to market, and KMT Waterjet Systems Inc. was in on the action. It introduced the FABTECH crowd to the new Streamline SL-VI series of pumps, with power offerings of 30, 40 and 50 hp at the operating pressure of 60,000 psi. Features include enhanced efficiency and productivity with predictable maintenance schedules, say company officials. Depending on the application, the pumps can be custom-built based on a variety of options to meet specific application requirements. Key features include enhanced performance with increased intensifier flow rate, and a NEMA premium motor design for optimized efficiency and reduced electrical consumption. Automation remains a hot topic among metalformers of all types and sizes, and Yaskawa Motoman Robotics, Dayton, OH, offered several new robotic solutions at its booth. 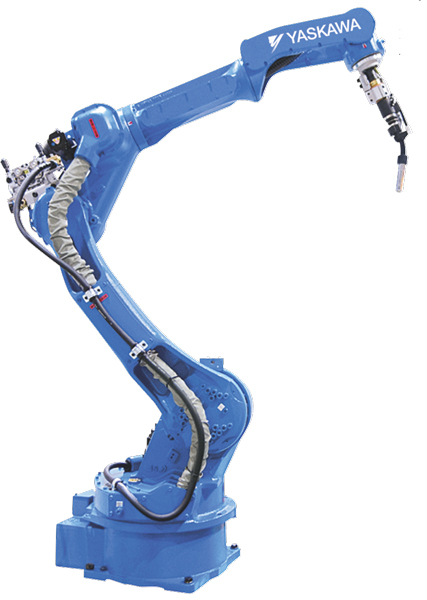 Included was a pair of arc-welding robots loaded with features to optimize fab-shop operations: the six-axis MA2010 (left), with a 10 kg payload and 23-percent larger wrist hole and six-percent longer reach than previous models; and the MA3120 extra-long-reach model —3121-mm horizontal reach, ±0.15-mm repeatability. The MA2010 features a new contoured arm that reduces interference by enlarging the close-range motion area of the robot; it’s ideal for welding large workpieces and reaching over jigs. Its hollow upper arm maintains the optimum bend radius of the welding-torch cable. The MA3120’s extra-long reach arm reduces the need for tracks and proves ideal for multiple-robot layouts. Press brakes of all sizes and with varying levels of functionality and automation abound at FABTECH, amongst them the new TruBend Series 3000 from Trumpf, Farmington, CT. Touted as “simple to operate, accurate and reliable,” the press brakes feature a new closed-frame design that reportedly increases overall rigidity and, therefore, increases precision compared to previous models. Backgauges move across the entire length of the machine bed, enabling unrestricted use when bending at the ends of the machine. And, automatic CNC crowning ensures consistent bend angles. 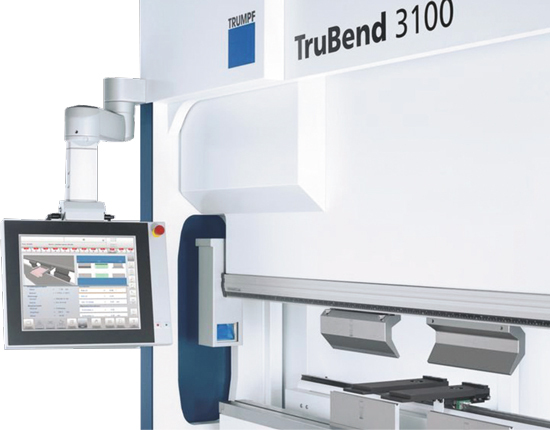 As the fastest machine in the class, the TruBend 3100—ideal for entry into precision bending—features a press force of 110 tons and 118 in. of bending length. It comes standard with a two-axis backgauge; four- and five-axis backgauges are optional. 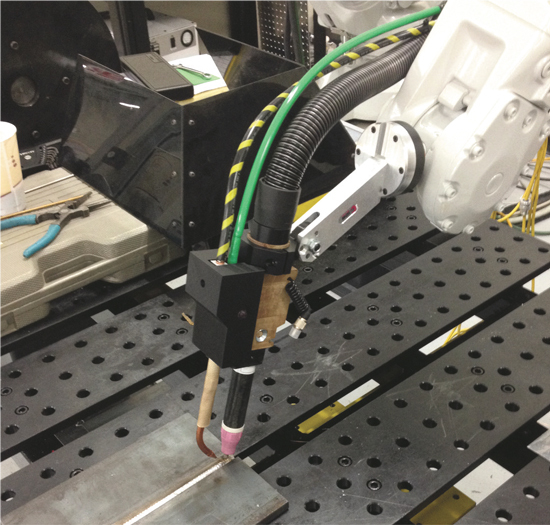 ABB showcased its ability to automate, via robotics, the Tip-Tig hot-wire GTAW process, touting its ability to, when compared with traditional automated GTAW, better cope with joint fitup gaps while providing higher travel speeds and lower heat input. The ABB robotic-welding cell at FABTECH featured the Tip Tig wire feeder, an IRB 2600 robot, a workpiece positioner and a Miller Dynasty 350 welding power supply. The solution is ABB’s newest standard function package and can be installed on any of ABB’s IRB140, IRB1600, IRB 2600 and IRB4600 arc-welding robots. The integrated interface supports the use of Lincoln Electric and Miller GTAW power sources. Thanks , I've just been searching for info about this topic for a while and yours is the best I've found out so far. However, what about the conclusion? Are you positive about the supply?